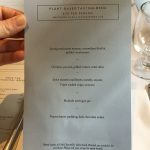 No meat or dairy on this Covent Garden plant-based menu, but it doesn’t stint on flavour or elegance. 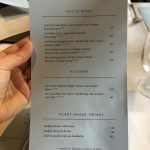 Special occasions call for special locations, so for Emmeline’s birhday (AKA bigv), we took a trip to Seven Dials in the West End to sample uber-chef Marcus Wareing’s seamlessly slick launch, Tredwells. The name is stolen from the butler in The Seven Dials Mystery by Agatha Christie, whose The Mousetrap has been playing around the corner for longer than anyone reading this has been alive (1952). We sat in the airy mezzanine of the three-floor restaurant, surrounded by racing green banquettes and overlooked by an art deco style clock bejewelled with knives while we looked out on to glittering Theatreland. But what kind of show could Marcus put on? Actually, it’s not Marcus doing the cooking here at all. 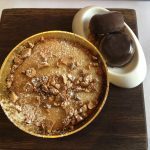 Head chef is Chantelle Nicholson – no vegan herself, but a cook who applies techniques such as caramelisation and using dairy substitutes such as aquafaba to give a rich, decadent feel to her food and concentrate as much flavour and creativity into plant-based dishes. We took so many notes and photographs that the (exceptionally unstuffy and friendly) staff must have thought we worked for Michelin and took us to the kitchens after coffee to gladhand her. 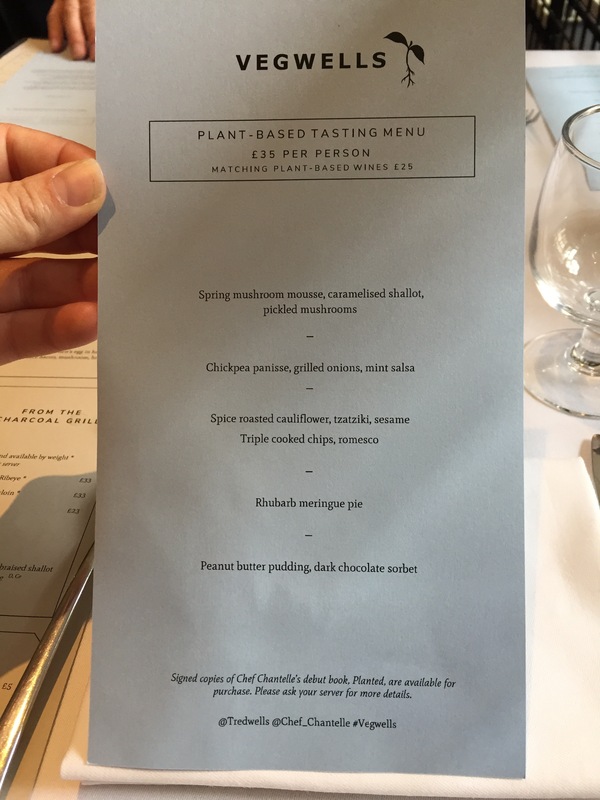 The five-course plant-based tasting menu, Vegwells, clocks up at £35 a head, with an extra £25 for matching wine. 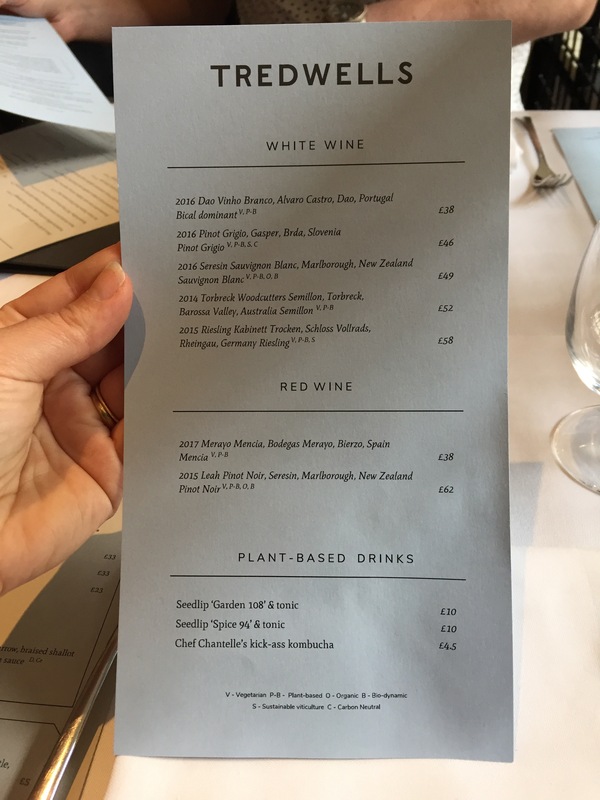 If that sounds too hard on the wallet, other plant-based nuggets are secreted among the a la carte dishes – avocado, lemon, kohlrabi (£7) and grilled broccoli, toasted almond butter, capers (£5) for instance. 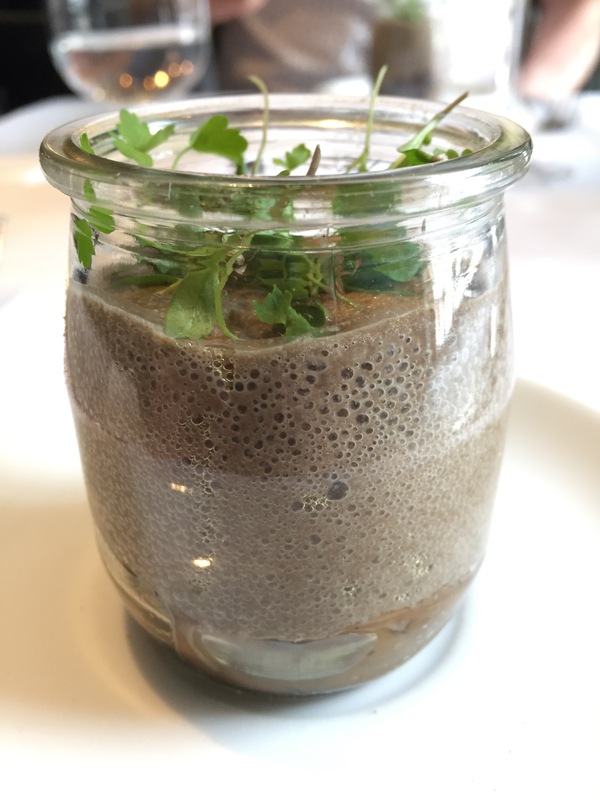 Feeling flush and thirsty, we tacked to the tasting menu with wine accompaniment. 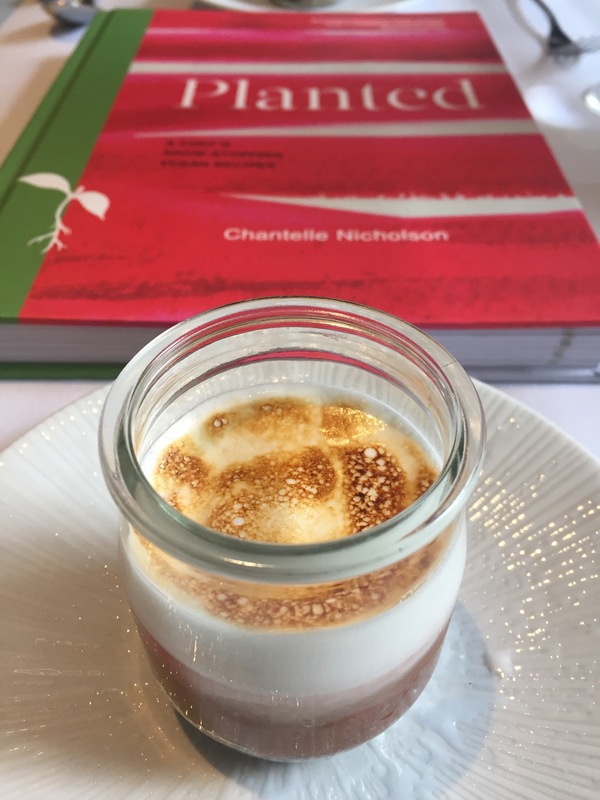 First up, delivered by our charming server, was a spring mushroom mousse with caramelised shallot and pickled mushrooms, citrus-cool and refreshing yet earthy and satisfying. It came in a jar I remember from my Shippam’s fish paste days. We slugged this down with a glass of Tredwell’s own creamy chenin blanc from the tap. Oozing with stonefruit flavour, it went down a treat – things were looking promising. Next up was a panisse, apparently a kind of Provençal chickpea fritter. I’ve roasted, boiled, fried and poured the aquafaba off countless tins of chickpeas, but scary 1980s public information ads about deep fat frying at a formative age meant this recipe had passed me by. A gnome’s tombstone of deep fried chickpea, toppled on to a mound of hummus, loured over by grilled onions and salad fronds, and daubed with bright green splashes of mint salsa was deceptively filling and delicious. It was accompanied by a minerally Slovenian pinot grigio that decisively cut through the caramelised onion. All tasting menus, as if to taunt your hubris in attempting more than two courses, start to ache a bit as your stomach begins to revolt against the remaining courses. Still, must plough on. 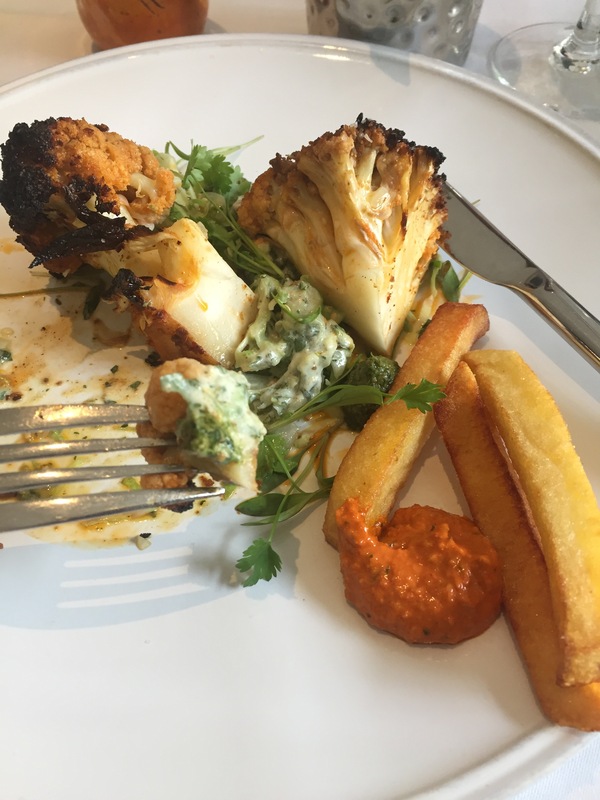 The third course was a quarter of a cauliflower, cooked almost a piece of meat would have been – spice-encrusted, seared and left to sit on a hot grill. That chunky stalk and the leaves you often cut off at home were defiantly left on, the leaves to crisp and blacken deliciously, the stalk to tenderise and give the dish a satisfying meatiness. 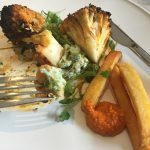 The cauliflower rested on a bed of leaves, frisky plant-based tzatziki and came with hefty triple-cooked chips and a dollop of romesco sauce. Pinot noir can be thin and sour, but the robust New Zealand that partnered this dish washed it down to perfection. 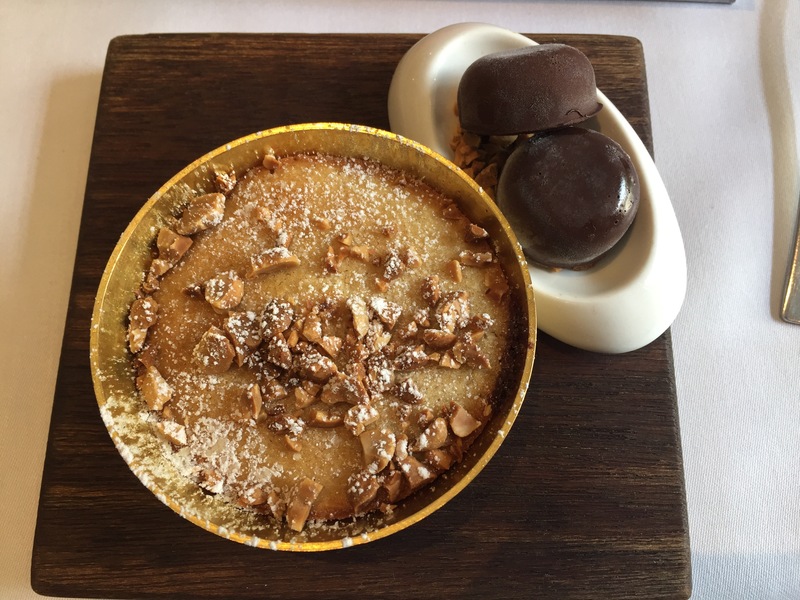 Two more courses rounded things off nicely – a palate-cleansing rhubarb meringue pie bruleed on top, sharp and sweet like a lovers’ tiff, and then an intensely savoury hot peanut butter pudding with dark chocolate sorbet moulded into pucks or Tunnock’s tea cake shapes. A very grown-up dessert, wolfed down with a smoky-sweet Tokay dessert wine. 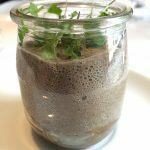 An elegant experience with top-notch service and real creative plant-based food – a real show stopper in Theatreland.